Moglix Business > e-procurement > How Internet of Things will affect Procurement Industry? International Journal of Business and Management Invention describes Internet of Things as a “new evolutionary step of the Internet, as not only computers are embedded in the network but any devices. Internet of Things. Unlike traditional networked embedded systems, interconnects heterogeneous devices from various manufacturers with diverse functionalities.” This has ushered a second age of the internet with this term floating around since 1999. The interconnections of heterogeneous devices is expected to usher an automation in nearly all fields. The IoT presents unprecedented opportunities to digitally enable the supply chain, and to create solutions that combine digital and physical products and services. IoT will revolutionise the global supply chain in both operational and revenue opportunities. How will IoT affect Procurement? Imagine a vending machine being able to send replenishment requests and signals to procurement team. This timely signal can put the procurement wheels in motion well advanced in time. 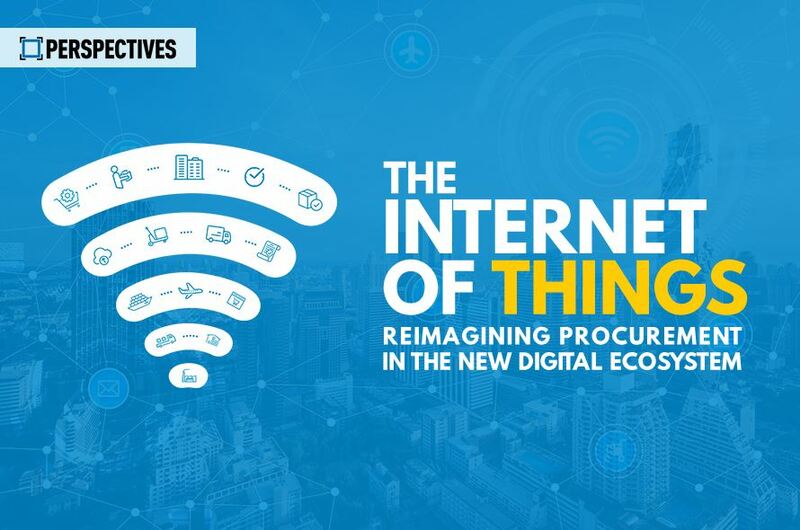 For procurement, the Internet of Things (IoT) will present an increase in spend visibility and a better understanding of supply and equipment usage. This will help your procurement team improve catalog content and spend management by knowing exactly what is being used and exactly what is needed. The ability to more accurately predict these needs will also greatly improve budget and contract management. As devices become smarter, more mobile and more connected, the devices used to manage them need to do the same. Mobile procurement will become an even more vital element of your procurement strategy. On the purchasing side, your users and employees will need their procurement workflows to be mobile and connected just like everything else in their lives. Even more important, however, is that the procurement department is able to analyze the insights gathered from its user’s purchases and activity in a mobile and connected way. Tracking numbers and barcodes are now the thing of the past. Newer RFID and GPS sensors can tracks products from store to floor. Imagine having the data available at your hand at any point in time about the temperature the cargo was kept in, how long it spent in cargo. Such data can enhance quality control. The data obtained through asset tracking can also be used by companies to alter their own production schedules. This allows you to handle your vendor relationships better. The data generation is a big winner. When you are already spending on big data analytics, imagine what they could with data from all your carriers, may it be a shipping container or delivery trucks. This data can help you boost up your deliveries and rectify bottlenecks that recur regularly. These similar sensors can also help you to do predictive maintenance enabling you to deliver faster.